Switch to a $1 coin? GAO study says scrapping dollar bills could save billions, but it’s a terrible idea. A new GAO study says we could save billions by replacing dollar bills with coins. Don’t believe it. 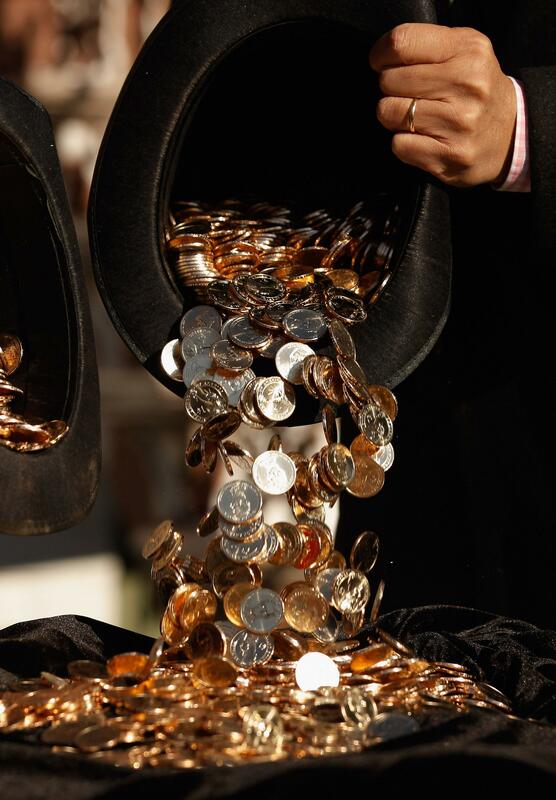 Hundreds of presidential $1 coins with the image of Abraham Lincoln are poured out of a black top hat during an introduction event in 2010. It wouldn’t really save money to eliminate the $1 bill and replace it with coins. But this is all bunk. Changing coinage doesn’t save any money at all and the debate over these illusory savings, though small in the scheme of things, reflects the fallacy-ridden manner in which federal budget issues are debated. The only sentence that matters in the whole GAO report is that the financial benefit is “entirely attributable to ‘seigniorage.’ ” That is a fancy word deriving from the French word for a noble lord. The idea is that you can take such-and-such amount of gold or silver, melt it down, cast it as a little circle, and then stamp a number on it. Then you go out and use the coins to hire people to do stuff for you. If the numbers you stamp on the coins reflect the exact value of the precious metals inside, then manufacturing the coins is a money-losing proposition. But if you stamp a number on the coins that’s somewhat higher than the value of the metallic content, then you’re making a profit. Of course, people might feel ripped off by your coin scam. But then again, you are the lord of the castle, so if they complain too much you can have them killed. All of this history has only a tenuous relationship to modern currency. Seigniorage largely went out the window when currency stopped being made of precious metals and instead became claims on precious metals. A $5 bill obviously doesn’t cost more to manufacture than a $20 bill, but in the classic days of the gold standard both were really just promissory notes. The bills themselves were stand-ins for gold, and the gold cost exactly what it cost. Governments in this paradigm suffered since the manufacture of bills cost something, and the bills added no monetary value that wasn’t already present in the reserves of precious metals. But in the wake of World War II, essentially all rich countries have moved to a system of pure fiat money. Dollars are valuable because other people think they’re valuable. The fact that the government will throw you in jail unless you pony up some dollars for tax purposes helps keep expectations coordinated. In a world of so-called fiat money, seigniorage runs rampant. Basically worthless pieces of paper are printed with certain magic figures, and suddenly they’re valuable. Coins generally cost more to produce than dollars, so at first blush replacing dollar bills with dollar coins would seem counterproductive. The advantage of coins turns out to be that the GAO thinks people won’t use them. Dollar bills circulate rapidly through the economy, accumulating wear and tear and needing to be replaced. Coins are much more durable. More importantly, they’re more likely to fall between the sofa cushions and be forgotten. Or to pile up in a sock drawer somewhere. I have a Ziploc bag in my dresser full of random coins. Every year or so I take the bag down to the supermarket and put it in one of those change machines. But for the year those dollars’ worth of quarters and dimes are a kind of interest-free loan to the government. Thus, the federal government’s fiscal position is improved. If improving the federal government’s fiscal position by creating money that people forget to use sounds silly, you’re right on. But there’s an important general lesson here: namely, that the government’s fiscal position per se is not that important a question. The fundamental issue should be the volume of real resources available to society, not an accounting math problem. Like the argument over eliminating the dollar bill, people sometimes argue that the government is wasting money minting pennies since their seigniorage value is so low. The better argument is that pennies are a waste of metal and people’s time—real things are consumed to create coins with little utility. Eliminating dollar bills would “save money” but inconvenience people and not make any new resources available. Evaluating proposals to eliminate pennies or dollar bills in terms of their fiscal impact is very misleading. After all, once you consider the seigniorage issue for a while, you’ll swiftly see that the government can’t “run out of money” at all. The government makes the money! The problem with something like a projection of out-of-control Medicare costs can’t actually be about a shortage of money. It’s about finding the hospitals and doctors and MRI machines to provide elderly people with the health care services they’ll want, or about funding a way to say no to them. This is a harder problem to think about than just making some equations line up, but it’s the much more important one.